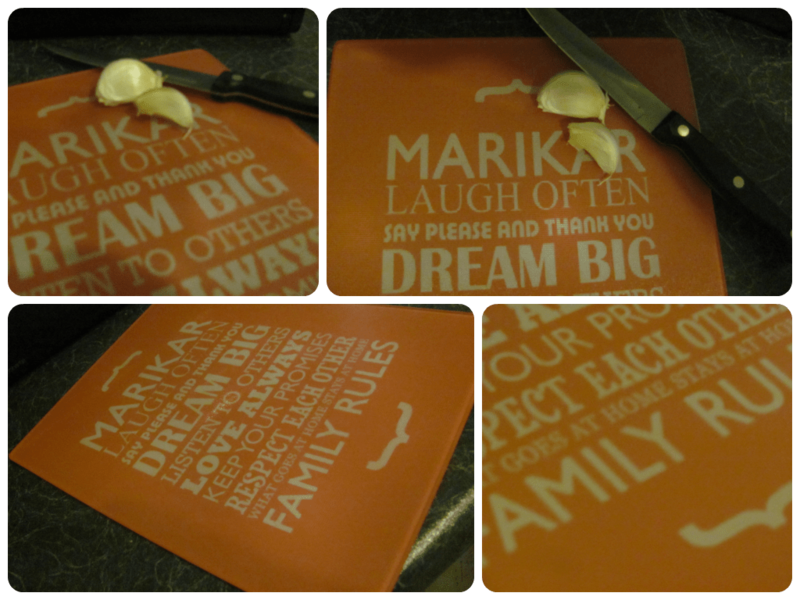 Recently I was sent a new Personalised Family Rules Glass Chopping Board to review from Treat Republic. It is not just a normal chopping board – it’s a personalised one with our last name and our family rules, which makes it much cooler! I’m really pleased with the chopping board. It is a good quality board made of thick glass and it feels like such an improvement on my old chopping board. The personalisation and family rules make it much more special and means that it works well as a gift. It’s manages to combine practical with fun as it looks great on display in the kitchen yet serves a functional purpose every day. It’s not always easy to find that balance with gifts! The personalisation is only for the Family name not to change any of the rules, but I think these are rules most families could stick to! You can choose between grey, blue or pink for the chopping board. My board, which is shown above, is the pink colour. It’s quite a subtle reddish pink not a totally in your face bright pink and it fits in well enough with any kitchen’s colour scheme. I haven’t seen anything like these in the shops so it’s quite unique. I like that my new chopping board adds a touch of personality to the kitchen and makes me smile while I’m chopping my vegetables, onions, garlic or whatever else for the cooking! Treat Republic also have another similar variety here where you can add a first name and a couple more options of personalisation. The Family Rules Glass Chopping Board is £24.95 from Treat Republic and is available for gift wrapping and next day delivery, handy if you are getting your Christmas presents organised already! 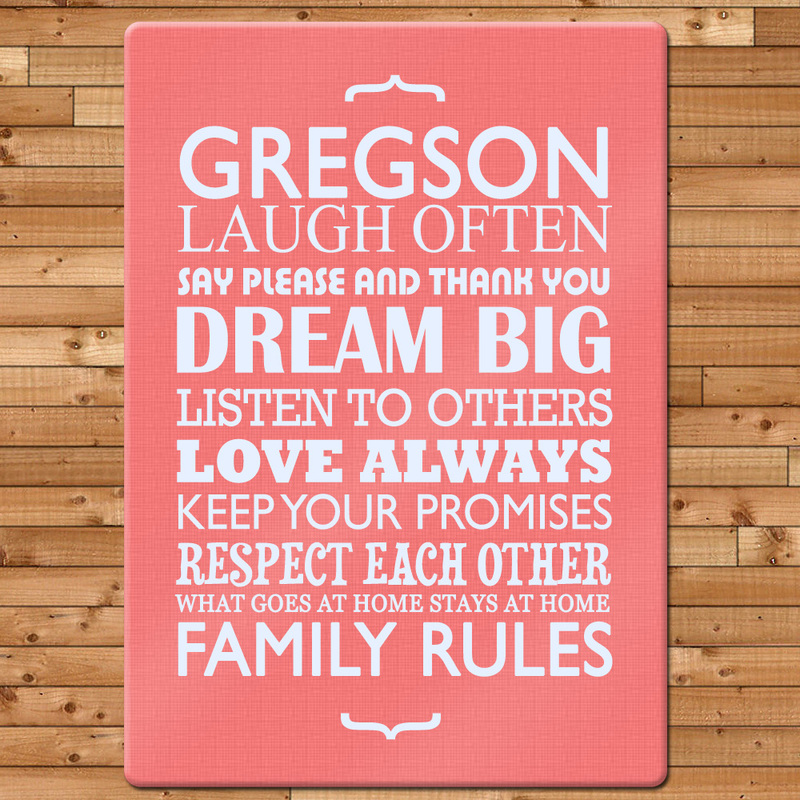 What do you think to the board, and what Family Rules do you have in your house? Share with me in the comments below! Love this, also pink would be perfect for my kitchen too! ET Speaks From Home recently posted…Need a Family-Friendly Corner Sofas? Looks like a nice idea for Christmas. House rule here – everyone has to be quiet or leave when the Grand Prix is on or Mummy gets cross!